Crossing the York River and connecting Gloucester Point to Yorktown and all points south, the Coleman Bridge is a necessary evil for anyone who lives in Mathews or Gloucester. It is the one and only way to get from No Man's Land to Commercial Activity of Any Kind, including shopping malls and every single retailer known to mankind. On the other side of this bridge are cities that look just like every other city in America, since we are becoming so homogenized with our Starbucks and our Bed Bath and Beyonds. I am perfectly comfortable with the amount of space between Mathews and these places. Perfectly comfortable. Except when I get tired of shopping at convenience stores stocked to the brim with beef jerky and pickled eggs. Does anyone really eat pickled eggs? Because Mathews is so rural (I'm not complaining, by the way), many people who work have to take this bridge every single day to get to their jobs. It's 30 miles from where I live to here, and most people have to drive at least another 10-20 miles after this, depending on where they work. The bridge can be vexing at times. For example, because it is a primary artery, it is often congested, especially in the afternoons. Also, it opens frequently for ships who need to get to and from the various Naval establishments in the area. Sometimes, it gets stuck open, which is a truly delightful experience. If you ever want to see what a person is really made of, watch how they react when the bridge is (a) open and then (b) stuck open. If they go with the flow, you've got yourself a calm, reasonable person. If, like most people, they are pacing up and down beside the car with their cell phone pressed to their ear, arms flailing and lips flapping, you've got yourself a hot head. It's a real easy litmus test. When the bridge opens, traffic is backed up for miles, and there's no way to get across the river, unless you backtrack another 30 or so miles and go through West Point, but nobody wants to do that. Most people would rather stick a hot poker in their eyes. I have dreamed about this bridge a million times; to clarify I should say I have nightmares about it. In Real Life it is a very tall bridge, and in my dreams I'm usually driving over it when all of a sudden there is no more road and I am plummeting to my death. Only I don't die, I have to swim the York River. Please don't tell me what this means if you analyze dreams for a living. I am certain I don't want to know. Thank you. The Coleman Bridge: Necessary evil and key ingredient in many nightmares, both literally and figuratively. This is a picture of the pump house on my parents' property and the base of the walnut tree that I wrote about yesterday. What's that yellow thing leaning against the tree? I have no idea. The ivy? That's probably poison ivy. The ATV next to the pump house door? That actually belongs in my garage. I have no idea what it's doing here. And that last statement, my friends, is the theme of this post, because I have no idea what any of the stuff in the pump house is doing there. Next to the barn I recently wrote about is a pump house with a windmill on top (currently housing a racoon family). As a kid, it was one of those places that I'd never venture into. Don't ask me why I would venture into a barn the size of the Super Dome and not into the tiny pump house, but I believe it had something to do with the proximity of the boogie men hiding inside. At least in the barn, you had a fair chance to get out if you heard something coming to getcha. The pump house was originally, and might I say obviously, where the farmer went to pump his water. (They were clever like that with the names and all.) Even to this day, my mother uses the water pumped here for her geese, also known as the only animals on the planet with one solitary purpose: to chase you down until they bite you to death. Seriously, what kind of animal strolls over into Someone Else's yard, while Someone is head first in her car, cleaning out french fries from circa 1998 and sticks its head between Someone's legs and proceeds to HIIIISSSSSSSSSS prior to biting? Only one, and that's the devil called a goose. But I digress. Inside the pump house is a whole netherworld. First of all, even if the temperature outside is 100 degrees in the shade and the humidity is at "can't catch your breath without drowning" percent, once you set a foot inside, the temperature drops down to this: ANTARCTICA. I recently asked my Middle Sister if she had any thoughts about the pump house. Her immediate reaction was, "The last time I went inside, I saw Mamma's league bowling ball with her name on it." Which is just a concise way of saying that between this pump house and the barn next to it, you can find just about anything, and I do mean anything, under the sun. Getting back to the whole bowling ball thing, I thought, surely to goodness that isn't in there. Is it? And if so, why? (We may never know the answer to that last question, so I just accept these strange things as inherent to living in such an odd place.) So off I trotted this afternoon to check out just exactly what IS living there. 1. My mother's bowling ball. 2. Another bowling ball with the initials RCB. Both bowling balls were located in the grass OUTSIDE the pump house. 4. An 8-track cassette player. 6. 1 basket of walnuts, circa 1978. 7. A Fisher Price push toy, circa 1974. 8. The wooden frame of an old wall-mounted telephone much like the one used by Ike Godsey of Godsey's General Store on the Walnuts. Sorry, I mean the Waltons. 10. A wooden box with MHS (Mathews High School) painted on it. It was used by the person leading the band out on the field during half time at football games. Time's up! The only thing on the list above that was NOT in the pump house was the dead body. But that's just because I didn't look hard enough. Rest assured there's one in there. And when nobody's looking, he gets up, stands on the MHS stool, and conducts music to an imaginary band, listening to music from the 8-track cassette player, munching on a walnut, practicing his bowling moves. Is my family the only one with a slight clutter problem? On second thought, don't answer that. This walnut tree is located on my parents' property right outside the barn I wrote about the other day. It's as old as Methuselah. How do you spell Methuselah, anyway? I have simply taken for granted the beauty and the wonder of our walnut trees. I realized this the other day when, taking advantage of the most unusual weather, I started snapping pictures next door on my parents' (at one time my grandparents') property. Most of the time, I'm cussin' the walnut trees because when the lawnmower runs over top one of those walnuts, with the thick green outer shell and the incredibly tough black interior, it's no different than running over a softball. Only there's a million of them. And John Deere's blades can only take so much of running over softballs. Not that I'm deterred by John Deere's inadequacies. Never mind the hazards of jet-propelled softballs. My mother saw me wandering around looking up at the sky, tripping over stumps and falling into holes, and said, "Did you get a picture of the walnut tree?" I mumbled something about trying to get a picture but not being able to keep from falling into holes and over stumps and such. Walking, talking and taking pictures is way out of my league. Anyway, she then asked, "Did you get a picture of the scar?" At this juncture I think she's talking about the scar on my leg due to wandering around the yard aimlessly, looking up at the sky with my mouth agape, where flies, seeing a nice dark place to rest, decide to gather. I had not heard of any scar on the walnut tree. She then pointed to a big rip just under the first branch of the incredibly huge tree. Evidently, one of the earlier owners of the property lost control of his horse and buggy, and the buggy did considerable damage to the then-young tree. The scar is still there, about 100 years later. I imagine the scars I contracted from walking around staring at the sky will be around for a few years too. Today I am going down a slightly different path than normal, whatever "normal" is for me. I'd like to analyze this picture and apply my interpretation of it to life. Here you see a little path leading to blue water on the other side. What you can't really see is a perfectly beautiful beach, untouched and undeveloped. Some people might see these green reeds as an obstacle to getting to the beach, and in fact they are. The only way to get through is this little path. Have you ever heard the saying, "Sometimes you've gotta go through the bushes to get to the picnic?" No? Don't worry. In any case, sometimes in life you have to go through some stuff in order to get to the good parts. Although there are many possible routes your life can take, there really is only one clear path even if you can't always see it and it isn't clear to you. And now for the really deep part: Sometimes, the things we see as obstacles are actually beautiful if we stop long enough to take a closer look. They prepare us and guide us for the good that's on the other side. See? I told you it was deep. You may now wake up and return to reading normal blogs, most likely already in progress. This ship is docked at Yorktown, and for a fee you can take a 3-hour cruise on it. Or, you can just take a picture of it from the beach and watch it go up and down the York River, which is what I did. I like to explore new options and live dangerously like that. Plus, it was really windy and there's no way I was setting foot on that thing without some serious anti-sea-sickness medication. This weekend I went to Yorktown for a couple of nights. For someone who lives in Mathews, it's a rather odd destination for an overnight stay, because it's only 30 miles away. 30 miles in most directions from Mathews doesn't get you anything very different as far as landscape and civilization are concerned, but the one direction 30 miles does make a difference is south. Without boring you with the details of the differences between Anything Majorly South of Mathews and Anything in Any Other Direction, I can just sum it up concisely with a few choice words: restaurants, shopping, human activities that do not involve the solitude of grass cutting, animal feeding, house maintenance or beef jerky. Nick's Seafood Pavilion was the most incredible restaurant I've ever been in. Owned by a Greek couple, it was known far and wide for its fantastic food (lobster dien bien was my favorite, and their salads were ice cold with the best dressing ever). The decor in Nicks' was definitely eclectic, a tad extreme, and very ornate. There were elaborate chandeliers, statues everywhere, intricate mosaic tiles (I might be making that up, but let's just go with it for effect) and beautiful linen tablecloths. Many a special occasion was celebrated there and it truly was an institution. Alas, Nick's and the Spectrum are no longer. They were torn down to make way for the new Riverwalk Landing, which is a very nice beach front establishment with several restaurants, some places to shop and a lovely sidewalk that meanders from the beach up the shoreline for about a mile. So, for Memorial Day, in honor of our nation's fallen, including those who fell at Yorktown, even though this would be a better topic for Independence Day, just never mind that, we have Yorktown, scene of some very historic battles, many lost lives and two lost institutions. This barn has been a part of my life since they brought me home from the hospital as an infant in the 1960's, and it's been in our family since the 1950's. My father’s parents lived in the farmhouse that went along with this barn, and eventually my parents ended up building a house right next door. The point being (don’t worry if you don’t know what the point is) I have strong ties to the barn. -One time when we were bored, which could have been any minute of any day of any year as a child growing up, my neighbors and I decided to turn the barn into a haunted house. We worked for weeks creating a spooky landscape complete with a grave yard, a place where you could feel eyeballs (Isn’t that what everyone wants to do? Sit around and pass eyeballs from person to person? They were peeled grapes, by the way, and I thought we were quite clever. ), and other ridiculous activities in the hopes of scaring our poor visitors to death. We were nothing, if not compassionate, merciful hosts. After all that work, I don’t remember more than one group going through it. And as a most unusual side note, about a year ago in a local thrift store, I saw the sign my mother painted for this very haunted house. I remember someone stole it (and I was very upset, because it was a great sign, my mother is very artistic) but who’d have thought it would end up years later in a thrift store? I didn’t buy it, by the way. I cannot explain why, but I’m sure a therapist would say it has something to do with being reminded of a failure….I, on the other hand, would simply say that I have enough junk as it is, and absolutely no need for a sign about a haunted house. -There was every sort of Anything Old a child could ever hope to play with in there. Tons of tools, old records, old skeletons and animal specimens. That’s what’s in every barn, isn’t it? Animal specimens and skeletons? My uncle was a marine biologist and left some of his stuff there…talk about a haunted house. Try being a kid snooping around in a dark barn and finding a jar of SQUID looking you straight in the eyes. There were many record-breaking sprints and screams that originated in that barn. -This was the headquarters for my grandfather’s daffodil business. After the flowers were picked we hauled them here to soak in buckets of water before packing them off in huge cardboard boxes to be shipped to parts unknown. I hated this part of the operation and usually made myself scarce when it was time to do the packing. I've always been helpful like that. -This was and still is a cat factory. Put one cat in, and four hundred pop out. It’s amazing. And these cats NEVER LEAVE. But perhaps my favorite story from this barn is one I can’t even remember because I was so young, about 3 or 4 years old. My grandfather, a very staunch, serious “rules are rules” type of person, was in charge of me. I wanted to go in the barn, and he obliged. Needless to say, my grandfather was not pleased, but I guess by the time he finished telling my parents and half the county about the offense, most everyone was laughing too hard to care. Ah, the barn. Playground, cat factory, haunted house and profanity practice field for up and coming children. Yes, this barn holds a whole lot of memories. And a whole lot of cats. It only took me four hours, three crying spells and five gnawed fingernails to load this photo. Seriously. I actually had no intention of writing about Wolftrap Light today...but the pictures I wanted to load would not do so. I have to save my sanity wherever possible. My children and I, determined to enjoy a crisp, clear 70-degree, humidity-free day (which occurs around here exactly this often: NEVER except for today), decided to go back to Haven Beach, also known as Old House Woods, also known as the haunted beach. Never mind that. For reasons unclear to me, and for the first time in history since the Jamestown Settlement, Haven Beach was closed to the public. Closed! On the one perfect day of the year. Determined not to let this get to me, even though inside I was seething and ready to write to my senator, if only I knew who he was, I said, "That's O.K. We'll just go to Bethel Beach." Right! Bethel Beach. The drive to Bethel Beach entails I have no idea because I can't tell you how to get to Bethel Beach from the Haunted Beach. In fact, I can't really tell you how to get to Bethel Beach from anywhere because I always forget the one route. Also, many miles of Mathews back roads are involved. Mathews back roads all look the same: long, windy unmarked roads with lots of trees on either side. The end. What I can tell you is after much hand-wringing in the back seat by my son, who knew darn well his mother did not know where she was going, despite her proclamations to the contrary, we arrived at a public beach. Not Bethel Beach, but one close enough to it. Now that you're asleep, I can tell you that I have been to this beach before. It is exactly between the haunted beach and Bethel Beach and if you look in the photo above, which looks out onto the Chesapeake Bay, just in the upper right corner is a place known as Wolftrap Light. Based on how far off track this post has gone, I will save the story about Wolftrap Light for another day. Or, on second thought, realizing there's really not much story left to tell, I will say this: Wolftrap Light is not the stuff you see in the right hand corner, although it is located in the right portion of this picture. Wolftrap Light is a lighthouse so far out into the bay on the right that you cannot see it in this picture, although you can see it from the beach. Someone recently bought Wolftrap, and I cannot imagine why. It would be just like staying or living on some offshore rig with nothing but deep water and horizon in every possible direction. Sort of like a wolf caught in a trap. Only the wolf is in the middle of the bay. With no decent food, no drinkable water, nothing to do and no decent internet connection. This bustling intersection is located on Gwynn's Island. There are times when a left turn at this stop sign can take all of this amount of time: YOU DON'T EVEN HAVE TO STOP. Or look to the right. Or left. 'Cause there ain't nothin' comin' in either direction, perhaps for hours....OR DAYS. When I was four years old (Please don't fall asleep yet), my Mumma and Daddy and I rented a house on Gwynn's Island whilst (an old Mathews term which means "during" lest you couldn't figure that out) our other house was being built. And when I say "Mumma and Daddy and I rented" I really mean they. Our house was located just behind this stop sign about a quarter-mile. - The water in the bath was so bad (How bad was it? ), the tub was permanently stained orangish-red and there was no amount of bleach or nuclear bombing that restored it to white again. - We lived next door to a wonderful family. The Mother of Wonderful Family was an incredible cook. I remember sitting at her kitchen table, usually not invited, eating hamburgers with applesauce on top. And it wasn't just any applesauce it was homemade applesauce. I've never heard of nor seen applesauce on a hamburger other than in this house. I'm just reporting it as it happened. - The one toy I remember playing with was a plastic riding lawn mower that I could actually sit on and push with my feet. This was a HARBINGER OF THINGS TO COME. In hindsight I cannot believe my parents actually had the wisdom and foresight, not to mention cleverness, to buy me this thing. And get me to love it. Because from March through forever, there is one thing that everyone in Mathews must know how to do (like it or lump it, take it down the road and dump it): Sit on a tractor for hours on end . I loved living on Gwynn's Island. I loved our house and I loved our neighbors. And gosh darn it, I loved that plastic riding lawn mower. Have I mentioned that in addition to spending a lifetime cutting my own grass, I also still cut my parents' yard sometimes? Folks, what we have here is another waterfront cemetery and a really old church. Kingston Parish was established in (drum roll, please) 1652. Yep, 1652. To be honest, I didn't even know there was anyone but Indians around here in 1652. But that's because I can't remember any of my history. Or where I last placed my car keys. There are many graves here from the 1800's (and quite possibly earlier, I didn't walk around and read every one), including that of Captain Sally Tompkins. She was famous for nursing Confederate soldiers during the Civil War. And some other things, too, but let's not get too bogged down in the details. OK. Time out. If I go back and read what I just wrote, the vast majority of it sounds like something my youngest child might have written as a school essay. And she's only in fourth grade. So not only am I unable to provide details, evidently I have lost my ability to construct a complex sentence. One final note: This church is on the same lane that goes down to Williams Wharf Landing, and it was also the turnaround point for the One and Only 5K race I ran a couple of months ago. The land it sits on goes down to the East River (or a creek off the East River, again with the details) and it is a beautiful, quaint little church. See the nice church. See Jane run. See Spot sit. See Chesapeake Bay Woman think long and hard before she publishes another post like this one. On my screen, this picture is blurry. On my kitchen counter, there are ants. I can't deal with the blurry picture right now, so I'm posting it. I also can't deal with the ants right now, so I am writing on my blog. The shot above was taken from Williams Wharf Landing in Mathews. It's looking out across the East River towards an old warehouse, a seagull who did not like me taking his picture, and a sailboat. Williams Wharf used to be where steamboats arrived on a daily basis from Baltimore, Newport News and Norfolk. My grandmother used to talk about driving all the way here from Gloucester just to see the steamers, whether it was the entertainment they brought, or the supplies or the people. Keep in mind that I am talking about Williams Wharf, which is directly BEHIND me in this picture. It would have made too much sense to actually take a picture of what I'm talking about here. And to continue taking things further from the topic, I'm going to give you a True or False test below. Some of the statements are about Mathews, some have to do with me. I am sure you can figure out which is which. 1. Mathews County is 87 square miles. 2. As we speak, there are 87 million ants marching across my kitchen counter. 3. Mathews County has 357 miles of shoreline. 4. I have gone to the store 357 times and each and every time I forget to get ant spray, ant traps, machine guns, and explosives to kill these insidious creatures. 5. 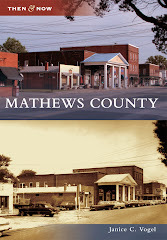 Mathews has a population of 9,200. 6. The ant colony trying to move in with me, take over and crawl all over me-- laughing as they slowly torture me in my sleep--has a population of 9,200. Answers: 1,3,and 5 are true. 2,4,6 have some truth in them, but the numbers may be slightly off as follows: Add FOUR THOUSAND to each number, and then the statements will be true. If it is possible to be ugly and beautiful simultaneously, the Great Blue Heron wins first place in such a contest. These amazing creatures are perfectly adapted for fishing or for frogging ('cause they like frogs too). Excuse me while I go sit in a corner and try and get the sensation of what it must be like to swallow a frog out of my system. How does one do that, by the way? I love living on the water, but one thing I could live without is the sound of a Great Blue Heron's screech at 2:00 a.m. It happens almost routinely, and I know what is going on. Whenever One Heron lands in the vicinity of Another Heron, one of them squawks. And it isn't just a squawk. It is a blood-curdling screech straight from The Exorcist. (Were there screeches in the Exorcist? If not, substitute the horror movie of your choice in its place. Thank you.) If one of their heads isn't spinning around, rest assured mine is. Complete with hair standing on end. And this lovely sound is just what one wants to hear at 2:00 a.m. I wrote something a while back about a heron here who came to the back door looking for handouts. Thankfully, now that the pickin's aren't so slim, the heron is able to fend for himself. I just wish he'd keep his nighttime activity down to a dull roar. I really need to get some sleep. Hole in the Wall is the name of an actual place that is not located in my house, regardless of what the name implies. This picture was taken from mainland Mathews near the old ice plant. The trees in the background are Gwynn's Island, and if you look to the right of the trees you'll see the Hole in the Wall. See it? No? Well, there are two very good reasons you don't see it. One, Hole in the Wall is just a name given to a particular spot of water where Gwynn's Island, Stutts Creek, and a few other important things such as I can't remember converge. It is also a popular fishing destination. (Or not, I can't remember that either, but I'm fairly sure my father used to fish there. Isn't it nice to come here and read factual, detailed, and highly accurate information?) Second, the picture above really doesn't show much of Hole in the Wall, which is technically a little farther to the right. But for now, I just like saying Hole in the Wall. And honestly until today I never realized how odd the name is. And, until just now, I completely forgot about the hole in the wall of my bathroom. Does anything else really need to be said about this photo? Of course, if I'm answering the question, the answer, regrettably for my one reader, must be YES. This was taken from Callis' Wharf, on Gwynn's Island (see yesterday's run-on entry about this place for more trivial details, that can hardly be called details but whatever was said is guaranteed to be trivial). In spite of the mouth-watering food I've just referenced, the accompanying cravings, the beauty of the background, plus the scenic water, the only thing I can focus on here is this truck. I love it. I absolutely LOVE old vehicles. I just love driving, and I love stick shifts, and I love anything that is different and no longer the norm. And No Longer the Norm pretty much describes life in Mathews. In short, I love this truck. Here's what's neat about this photo. It's a shot from Callis' Wharf on Gwynn's Island, and it includes a vista (what a regal sounding word, vista) of Mainland Mathews, which in this particular instance is actually the Coast Guard Station, also known as Something Adjacent to CRICKET HILL. Cricket Hill is where the last Royal Governor was chased away. From Virginia. Or at least from Mathews. Or rather, someone was chased away from Cricket Hill. And it was a good thing. I assure you. Callis' Wharf, on Gwynn's Island, is an incredible place, with an incredible history. If I knew the actual history, I'd share it with you now. I assure you. The depth and breadth of my historical knowledge is impressive, no? What I can tell you is this: Callis' Wharf was once (and to a lesser extent still is) a burgeoning seafood place, where the local watermen process(ed) the day's catch, which could be crabs, oysters, clams, fish, The Loch Ness Monster's cousin CHESSIE, and other aquatic delicacies. At various times a small market has thrived there. Long ago, before the bridge, a ferry ran from the mainland to this wharf (just like every other place around here with a bridge, there typically was once a ferry). What may not be very evident from this angle, however, is just how important this particular SWATCH of water actually is. (I am acutely aware that one does not ever procure a SWATCH of water. Acutely.) Right here, in front of Callis' Wharf, and just beyond under the Gwynn's Island Bridge, travel hundreds, perhaps thousands, perhaps even MILLIONS of boats in any given year. Seriously. It's a very busy place. If Mathews ever does gets a stoplight, it should definitely be a nautical one. Right here. One of the most VEXING maritime challenges exists right in front of this wharf. Milford Haven (the name of the area between Gwynn's Island and Mainland Mathews) is where "red on right returning" (a navigational phrase which causes my eyes to roll skywards and then backwards and then upwards again until you see the whites, which sometimes appear to be reds) CHANGES. Because you are no longer--all of a sudden--returning. You are going outwards. To the Chesapeake Bay. And therefore "red on right returning" switches to "red channel markers should be on your right even though you are not returning anywhere." OR SOMETHING LIKE THAT. Is it not abundantly clear at this point why I cannot navigate?? For now, all that's left of any mercantile activity at Callis' Wharf is the vibrant, red Coke machine amidst the old, white buildings. And how appropriate. Because truly, being so representative of Mathews County and its heritage of watermen, Callis' Wharf is indeed The Real Thing. Yes, folks, it is true. This used to be an official, honest to goodness United States post office. This is a picture of the old Hardyville post office, located in downtown Hardyville. The other noteworthy and distinguishing landmarks here include: There are none. A delightful lady fondly known as POOKIE used to be the post master (mistress?) here. And I will say it again: This was the actual Hardyville post office. Now Pookie happens to be the mother of the male friend who took me on the marathon water skiing trip I talked about yesterday. Pookie also has a personality so large, I cannot imagine how it fit inside this small building every single day. I'd like to point out something that is obvious to me, but perhaps not so to everyone else: Around these parts, most folks drive to the post office to pick up their mail. Although mail delivery is available, I personally do not know a soul who takes advantage of this, and I have absolutely no explanation as to why. It's just the way we do things. The post office, therefore, has been and continues to be a gathering place for people who live in the community. And, just like Hardyville, most "sections" of Mathews, Gloucester and Middlesex counties are named after the local post office. I have some questions about this particular post office, though. 1. Where, pray tell, is the RESTROOM??? I must know the answer to this. I won't be able to sleep at night until I find out. 2. Exactly HOW MUCH MAIL can actually fit inside this structure? 3. Aren't jail cells bigger than this? 4. If Pookie is in this one-room closet sorting all the local mail, and a family of four walks in, WHERE DO THEY FIT? What is the protocol for determining who has to wait outside? 5. WHERE IS THE BATHROOM????? The current Hardyville post office is in a slightly larger building right next door to this one. Pookie no longer works as the post master (mistress?) either. She finally retired after too many years of having to go outside to change her mind. Say Piankatank really fast, at least four times in a row. I dare ya. The Piankatank River is considered the dividing line between Mathews and Middlesex Counties. (Hey, I don't make these names up, I just report them as they are. I couldn't make this stuff up if I wanted to.) Piankatank obviously is an Indian name, which loosely translated means, SOMETHING. The Piankatank also divides Mathews and Gloucester counties. Around here, rivers do a whole lot of dividing. The interesting thing about the Piankatank is that right here where the bridge is, the water starts to turn from salty, which is inherent to the Chesapeake Bay, to fresh. Meaning one critical thing: no stinging nettles (aka jellyfish to non-Mathewsonians). One time, many moons ago, a male friend of mine who had a boat (which was and still is the Mathews equivalent of being DONALD TRUMP), invited me to go water skiing. Little did I know that when he said water skiing, he meant marathon skiing trip worthy of the Guiness Book of World Records. I "pulled up" right here under this bridge, right where the water starts changing. And I skied all the way to what is known around here as Dragon Run. Stay tuned for the next post, which will talk about The World's Smallest Post Office, located right across this bridge, in Middlesex County. I swear I do NOT make these names up. The Mathews Methodist Tabernacle pictured above is on the National Registry of Historic Places. This is a (bad) shot of the tabernacle. For the uninitiated, a tabernacle was basically an outdoor church "back in the day," where "day" in this instance is defined as circa 1900. Not my day, but Somebody's day, if Somebody is 100 years old. This tabernacle is located below the courthouse in Mathews. According to a local publication, the Methodist Tabernacle was long used as a revival center. The original one was built around 1879, but the one pictured here had to be rebuilt in 1922, probably due to fire. I could do some research on the tabernacle, but I'm fairly lazy. In the ideal world, my Mathews commenters would check with their relatives who were alive around 1900, or 1879, or 1492. It's all the same. Truth be told, there are still many people living who would have great stories to tell of this tabernacle. For now, I'll leave those stories alone and let the picture speak for itself. And what it's saying is, "If only these Outdoor Church pews could talk." Today and tonight we're under a flood watch, which means that AT ANY MOMENT WATER WILL COME GUSHING INTO MY GARAGE, MAKE ITS WAY UPSTAIRS AND DROWN US ALL. It also means that I am sure that the boat we store in our circa-1970's boathouse (in a state of disrepair) will SINK because the tide will rise too high and will smoosh (that's a nautical term) it against the roof of the boathouse, causing water to come gushing in, causing the doggone think to SINK. And the reason the boat will sink is because it is practically new and we never, EVER, use it, and of course there's only forty-two years of payments left on it. The reason we don't use it is because (a) gas costs more than PLATINUM and (b) using it would imply we know how to navigate. I could very well post a picture of how the tide is up over the dock right now, and I could WADE out to the end of the dock and try and snap a photo of the boat on its way to being SUNK, but that would ruin my whole state of denial. Because if I don't actually SEE it sinking, then there is still the possibility that it isn't (even though it just HAS to be based on how high the water is right now). In other flooding news, my KITCHEN SINK IS CLOGGED AND THERE IS A POOL OF NASTY, GARBAGE-FILLED BLACK WATER approximately one foot deep lying stagnant in the sink. When it rains, it pours. It's gonna be a long, sleepless night. - is incredibly beautiful, always has been. - loves animals. She has been known to pull over on the side of the road to rescue turtles from impending death. One time she rescued a SKUNK whose head was stuck in a jar. She lifted the jar up to shake the little rascal free and guess what she got in return? A skunk-stenched shower. Do you know how long it takes to get rid of skunk smell? Mr. Skunk went on to lead a happy life while my sisters and I kept a healthy distance from my mother until we could breathe again. - is an amazing, mostly self-taught artist. She recently took some really old windows from the farmhouse she lives in and painted Christmas scenes on them. They are absolutely stunning, and I'm trying to get her to enter them in an art show. - is a very gifted piano player and singer. She can play any song you want by ear and sang in a quasi-professional group in her youth. - is very smart and knows more about most topics than I ever will. She absorbs information like a sponge, subscribes to a couple of science magazines and can debate most anything very adeptly. The extent of my science knowledge is as follows: Insert sounds of crickets chirping here. - attended every sporting event my sisters and I ever had, which was a LOT. She also spearheaded a fund-raising campaign that earned enough money to put in a track at the local high school. - cooks just like her mother did, meaning that she can take what appears to be minimal ingredients and concoct a feast fit for a king. She is an old-fashioned, Southern style cook. Stewed tomatoes, spoon bread, fried chicken, mashed potatoes, kale, collard greens, oh my heavens I'm getting hungry. -was and still is very athletic. She was one of the first females to receive a varsity letter for basketball from Gloucester High School (they played half-court back then). She and I and my middle sister also played on a summer softball league when I was a senior in high school. She threw better than I could and hit that ball like nobody's business. These days our physical fitness is limited to walking and going to Curves, but she can keep up with the best of 'em. -was the only person I wanted around me after I had my first baby. I read every baby book known to man and tried to follow the doctor's instructions to the letter, and she was wise enough to teach me that one size does not fit all babies, and you have to do what feels natural. For example, when my son was gnawing his fists and crying all the time, she suggested we feed him some rice cereal. Rice cereal was not on the Approved List of Things To Do for many weeks or months yet, according to the books. Well, when nothing else would work, we tried the rice cereal, and baby boy finally got what he wanted. There is no substitute for one's own mother when you are learning the ropes. No substitute. I could go on and on about my mother, but I'll end with this: I love Mumma and am very grateful to her for all she has done and all the sacrifices she made for us. Most of all I'm glad she's still around to support me. And, of course, cook that fried chicken. This is a picture of the Chesapeake Bay from Gwynn's Island. What I can tell you about the bay involves a whole lot of SEA SICKNESS. My father used to love to go fishing, and of course with all of the hundreds of rivers, creeks and other perfectly fine fishing spots located really close to us, he had to go all the way across the bay to a place called The Cell. The boat ride that lasted for an eternity to get to The Cell was known as The Hell. As you can see above, the bay is so large that you can't even see the horizon of the Eastern Shore. There is a whole lot of Nothing But Water everywhere you look. A boat ride across that bay takes a long time; a conservative estimate is FOREVER. And when it is blowin' (as they say around here, meaning it's windy) that boat ride takes even longer than forever. There is no land in sight, and the boat is bobbing up and down. Up and down. Side to side. Up and down. And little Chesapeake Bay Child would be trapped in the cabin of the boat, bouncing around like a popcorn kernel in a vat of hot oil. A popcorn kernel with a GREEN FACE. The worst part of all was there was no relief from this torture. Once we got to The Cell on the other side of the bay, we would anchor and drop fishing lines, but we were still bobbing up and down like a tiny piece of cork. And there was no land in sight. So to recap: long boat ride there plowing through nine-foot waves, long time waiting for people to catch fish while boat bobs up and down with absolutely no relief, and another very long ride back home, only this time we have DEAD FISH TO SMELL. The Chesapeake Bay is beautiful, but not from the cabin of a fishing boat. The view from Gwynn's Island with my feet planted firmly on dry land suits me just fine. This is a picture of the old Moon post office, conveniently located in downtown Moon, VA. The new/current post office is just down the road a spell and is much less interesting. Moon is another "section" of Mathews, similar to Hallieford and Hudgins. It's just the name of an area within the county, usually associated with a combination former country store and post office. Folks from all over the country wanted stuff with the Moon, VA (we're now up to six Moons) postmark. Don't ask me how I know this, I just do. I either heard it or read it. Or dreamed it. Take your pick. Another interesting factoid about this Moon (seven) post office is the incredibly sharp turn in the road located directly in front of this building. One time, Someone Who Shall Remain Nameless, was home from college and was terribly bored. She wanted to go down Haven Beach and see if there were any submarine races going on, or if there were any cold beverages being enjoyed (Pepsi, silly, definitely NOT an Alabama Slamma or Purple Passion. Definitely not.) In order to get to Haven Beach, you have to pass by the old Moon (eight) post office and negotiate this severe turn in the road. Someone was too busy listening to Rick James on her 8-track cassette via the power booster that was conveniently installed in her green VW bug, meaning that everyone in the Moon (nine) vicinity was enjoying Rick James, too. Someone was going about 55 in a 35 mile per hour zone. Someone was in trouble. Anyway, let's just fast forward and note that once Someone realized there was this sharp turn involved, even though she had been through there a thousand times and knew darn well the turn was sharp, Someone screeched on the brakes. Someone's VW bug did a 180-degree turn in that road and did NOT go in the ditch or into a tree, which is truly a miracle. Note: This picture was taken during the winter months and is all brown and unappealing in its color, other than the rainbow, which I suppose is the point of the photo. Now, if I were to look in the same place, there would be nothing but green. And more green. And grass that has to be cut. And more grass. And grass on top of grass. Enough. If there really is a pot of gold at the end of a rainbow, this particular pot of gold is located in Hallieford, which is a section of Mathews County (where section is equal to a piece of land the size of Rhode Island). Hallieford is home to the world-not-so-famous COW POINT, which was where we all went during the summer in our little skiffs and 16' boats with 500 h.p. Evinrudes on the back and zzzzzzzzzzzzzzzzzzzzzzzzzzzzzzz . Go ahead and fall asleep. I already did. How many of you even know what the heck I'm talking about when I say Evinrude? Johnson? Cub Cadet? Bueler? Anyone? I happen to be an expert on small boats with over-sized outboard motors, and truly this is a story for another day, but it does involve me going so fast down the creek in such a rig and cutting the boat so sharply that the ENTIRE OUTBOARD MOTOR FELL OFF THE BACK OF THE BOAT and if it were not for the GOD-PROVIDED CABLE that held the motor on the boat, that motor would STILL be going on its own accord down the creek and into the bay. Completely independent of me and the boat. Sort of like a chicken with its motor cut off. As usual, I digress from the point, if in fact there ever was one. Cow Point, aside from Elmo Broaddus's post office/former store, is the most well-known part of Hallieford. It has an enviable view of Gwynn's Island, Queens Creek and off in the distance the Piankatank River and the Chesapeake Bay. There is a lot of sandy beach at Cow Point, and it is the perfect location for launching a water skiing extravaganza. Hallieford is also the home of a friend of mine, whose daughter(s) may or may not read this blog. This is a challenge to that daughter to figure out how to post a comment on this site and tell me a little bit of trivia about Hallieford. And reigning this out-of-control post back to the original photo and title: Mathews County is truly the pot-of-gold at the end of the rainbow. Either that, or it's just a pot at the end. Of something. Truly. This is a picture of a very typical (for these parts) red barn, dating most likely to the early 1900's. The red paint can be found on most of the old barns around here, those that are still standing anyway. For example, the barn where I found the shutters and painted them pink on an otherwise boring day (see April archives, I have no idea how to link it and cannot for the life of me focus on the details of learning how), is also this same red hue and definitely built around the same era. The barn above is located in a field adjacent to a home my mother lived in as a child (one of several, she moved around a lot courtesy of her father who gambled and won some, lost some). It's located on the dividing line between Gloucester and Mathews counties. I have not asked her, nor do I know, whether this was originally part of the property she lived on, but I suspect it is. I have always been drawn to this, even more so now that the roof is peeling back and its vulnerabilities are exposed. That's from one heckuva storm we had a few weeks ago, one where the house spun violently in circles and I thought for sure I'd find the witch's ruby red slippers underneath the foundation after we landed and I went outside. I didn't. But I did find the Fountain of Youth. It's located on the edge of our property, right near Robert Mondavi's grape juice stand, which came in quite handy for dealing with the storm's aftermath. This is it. Beautiful and serene. I didn't see any ghosts that day and was very disappointed. See that green squiggly stuff in the foreground? (Second note: Green Squiggly Stuff is a technical term I learned in Mrs. Gibbs 9th grade Earth Science class. I've got a memory like a steel trap. Or a sieve. You be the judge.) Anyway, back to the green squiggly stuff. The marine science portion of this post is now over. The non-marine science portion of this post, aka the HOT AIR, is also now over. If there were such a thing as a Kid Paradise during the 1970’s in Mathews, the Islander Motel and Restaurant on Gwynns Island would hands down be IT. OK. This picture has to be blurry. I apologize. But never fear. I have other unblurry ones that will be featured in future editions of The Islander: Unattended Children Gone Wild. The Islander, pictured above, used to be a combination “anyone can join for a small fee” county swimming pool, restaurant, lounge (shhhh, don’t tell anyone, but people actually drank in Mathews, they don't do it anymore) and marina on The Most Beautiful piece of waterfront property known to man. If that man lives in Mathews. It was also where I learned many of life’s lessons. I’m feeling frisky today, so let’s take a Pop Quiz, shall we? c) to be dropped off, with no adult supervision, at a swimming pool exactly 8 miles from home and 6 As the crow flies. This would be The Islander Pool. It was 8 feet at the deep end and had a diving board along with a "life" guard. c) go rooting around in the marina trash cans for aluminum cans for money. c) Your father’s mother promised to pay you a certain amount of money, namely a PENNY for every aluminum can you procured, no matter how much disgusting Pabst Blue Ribbon was swirling around in a hot, hellish vortex of NASTY at the bottom of each can, so therefore you stood on your head in trash cans trying to locate any and all things aluminum. 4. When you were left unattended like every other child in the county at the time at the Islander swimming pool, what are some of the things that occurred that your parents never witnessed? b) I got married and they never knew. OK. Enough. The Islander is going to be the subject of many future posts here, because there are simply too many stories to tell in one sitting. Sadly, the Islander currently is in a state of decay, although it has so much potential, and is really only used as a marina and a place for the occasional hotel guest. Hopefully with sense enough not to round that corner too quickly and run dead into the metal telephone booth. Or dig for beer cans. The photo above is as blurry as any of the others I've posted here. I can't care because if I did I'd have gone through two Kleenex boxes by now. I'm doing the best I can and am a slow learner. If you wear glasses, take them off. If you don't wear glasses, grab someone else's and put them on. Surrounded on three sides by water, Mathews has its fair share of waterfront property. There are homes on the Chesapeake Bay, the Mobjack Bay, the East, North and Piankatank rivers, and a multitude of creeks that run like veins throughout this county. But here's a little known fact: Not only can you LIVE on the water here, you can spend your days of ETERNAL SLUMBER on waterfront property as well. Yes, folks, I'm talkin' about a waterfront cemetery. I live directly across the creek from a cemetery, a large one. The picture above is just a smidgen of the entire place; it's pretty darn big and it's on some primo real estate. Another little known fact about that cemetery is that many high school students go there to watch the submarine races. These races occur every Friday or Saturday night around 11:00 p.m. Check your local paper for race times near you. Also, another great feature of this cemetery is its convenient location right across the road from the Little League field, where they sell The Best sweet iced tea and BBQ sandwiches. So, you can go visit your loved one's grave and hit the ball game right afterwards. Or vice versa. We're pretty laid back around here. Do what you want. My grandparents, on whose homestead we now live, are buried there, along with my uncle. All my life I've said to anyone who would listen that I want to be buried over there. Because I was born on the water and I want to be dead on the water. But I'll take the dead part a little bit later on, thank you very much. There's a whole lot of livin' left to do. O.K. I confess. Buttercups can be beautiful and aren't just invasive weeds. This sea of yellow is actually in Gloucester, a neighboring county through which we all must drive in order to get to any sort of civilization, namely a store that offers more than Cajun-Jalapeno-BBQ-Honey Mustard beef jerky. And now I have one more confession: As much as I make fun of beef jerky, I actually like it and have been known to devour an entire bag in a matter of minutes. This may or may not be the scene of a crime that may or may not have been committed. But know this: No stop signs were harmed in the making of this post. One of the first Halloweens where I was too old to trick or treat was the saddest day of my life because I love candy, and free candy is even better. OK, not really on the sad part. But really on the candy part. The plan was really quite simple: We'd steal a stop sign and then go toilet paper our teacher's house. That's the first thing YOU'D do, isn't it? Right. We left at dusk, so there'd be enough light to fulfill our mission and yet just dark enough to work in stealth mode. The particular vehicle we were using was my parents' VW bus that had a faulty horn. By faulty I mean that out of the blue, even if the driver's hands were tied behind her back and she wore a straight jacket, blindfold and were encased in a tomb, that horn would honk. By itself. A very distinct honk. A VW honk. We decided to tackle the stop sign first. We drove to the end of my lane where the road intersected one of the Two Major Highways in Mathews, Route 198. I pulled the bus to the side, right in front of the sign. We waited until there were no cars coming. Alda got out and began pulling and tugging. She pushed, she heaved, she wrapped herself around that sign and began to make some progress, when all of a sudden----HONK!! HONK!! HONK!! HONK! !--- That VW bus decided right then and there it was going to participate in our venture and BLOW OUR COVER. We began to panic. We could NOT draw attention to ourselves. (After all, isn't a stop sign state property or something?) Undeterred, she continued to tug, and the horn continued to honk in synch with her moves like the accompanying orchestra for a ballet. And, while Alda was putting some creative moves on that stop sign, this GRAND THEFT OF STATE PROPERTY was hardly a ballet. Due to the absolute horror of potentially being discovered thanks to that VW bus, and the impending INCARCERATION that likely would follow, I don't even remember if we ever did get that sign out of the ground. I do know that we laughed until we couldn't breathe, while adrenaline coursed through our veins with all the speed of Niagara Falls. Then, with all the reckless abandon and glee of IDIOT SAVANTS TURNED LOOSE IN A CANDY STORE, we toilet-papered our math teacher, Mr. Brown's, house. (I'm sorry, Mr. Brown.) We definitely made up for our first botched mission.